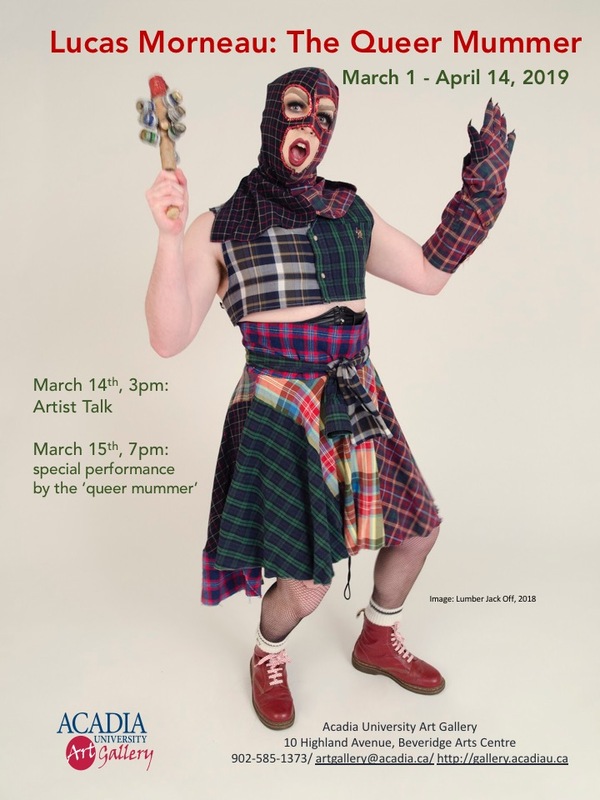 Newfoundland artist Lucas Morneau’s solo exhibition, The Queer Mummer, on display at the Acadia University Art Gallery until April 14, intertwines photography, fashion, and performance to deliver a sincere and profound exploration of identity by blending together drag and the Newfoundland tradition of mummering. Despite both being historic forms of performance, drag has been othered, while mummering has been accepted. Through this blend, Morneau critically confronts attitudes and perceptions deeply held within the public eye and canon. In this exhibition, Morneau grapples not only with an exploration of drag but also identity, with both being an almost ritualistic, repetitive process of concealing and unveiling. His work speaks to the significance of self-portraiture as a way to explore one’s own identity in rare isolation from the gaze of others. His photographs, near life-size, break down barriers usually existing between the viewer and the art – adding realism and an even starker confrontation to our predominantly held notions of gender and masculinity. They also seem to recreate the presence and movement of a live performance, ultimately presenting identity as something always in flux. Within Morneau’s work lies a powerful notion – that gender is performance. While the photographs are truly powerful, and one should visit to see them in their own right – one must definitely stop by to view the garments – all hand-made and equally gorgeous. The incorporation of textile art by a contemporary male artist challenges the common associations one makes with crocheting and knitting – associated not with art but with craft and domesticity, and often viewed as a gendered role ‘naturally’ assigned to the woman. The Queer Mummer, then, explores the role of gender in our life with nuance and, more crucially, opposition. This exhibition challenges the structures and constructs woven into the very fabric of our society – the deeply embedded gender conventions, the dominant masculine, heterosexual worldview, and the stifling influence of conformity on the individual, one in which identity is more an iron cage than it is a scarlet robe. Morneau destroys the idea of drag and henceforth, identity, as being singular, binary, and unchanging. This is an artist who recognizes the paradox of the mask: that under a mask, a person’s self is veiled and hidden and yet because of this, they can become their truer self. Morneau is an artist in full knowledge of the fact that we cannot bear to live with or without our masks. As the artist himself put it, “being myself all the time is tiring.” And so, we resign to keeping the masks on – and perhaps, when we are tired, to switching them out. One mask for another – always changing and always performing. A mask for a mask.